This project, which began in 2017, seeks to explain the ingredients that enable the sharing of misinformation and disinformation on social media. It also incorporates the establishment of a new Centre for Doctoral Training at Loughborough University, the Online Civic Culture Centre (O3C). Chadwick, A., Vaccari, C. and O'Loughlin, B. (2018) ‘Do Tabloids Poison the Well of Social Media? Explaining Democratically Dysfunctional News Sharing' New Media & Society. DOI: 10.1177/1461444818769689. This project began in 2011 and has so far resulted in a book: Chadwick, A. (2013) The Hybrid Media System: Politics and Power (Oxford University Press; Second Edition, 2017) and several articles. The book was awarded the Best Book Award of the American Political Science Association Information Technology and Politics Section (2014) and the International Journal of Press/Politics Best Book Award (2016). The second edition published in August 2017. In addition to a new preface, it features an extensive new chapter applying the conceptual framework to the extraordinary 2016 U.S. presidential campaign and the rise of Donald Trump. Chadwick, A., O'Loughlin, B. and Vaccari, C. (2017) ‘Why People Dual Screen Political Debates and Why It Matters for Democratic Engagement’ Journal of Broadcasting & Electronic Media 61. Chadwick, A. and Dennis, J. (2017) ‘Social Media, Professional Media, and Mobilization in Contemporary Britain: Explaining the Strengths and Weaknesses of the Citizens’ Movement 38 Degrees’ Political Studies 65 (1), pp. 42–60. Chadwick, A., Dennis, J., and Smith, A. P. (2016) ‘Politics in the Age of Hybrid Media: Power, Systems, and Media Logics’ in Bruns, A., Enli, G., Skogerbø, E., Larsson, A. O. and Christensen, C. (eds) The Routledge Companion to Social Media and Politics (Routledge), pp. 7–22. Chadwick, A. (2015) ‘The “Social Media” Maneuver’ Social Media and Society1 (1), pp. 1-2. Vaccari, C. Chadwick, A. and O'Loughlin, B. (2015) ‘Dual-Screening the Political: Media Events, Social Media, and Citizen Engagement’ Journal of Communication 65 (6), pp. 1041–1061. Chadwick, A. and Collister, S. (2014) ‘Boundary-Drawing Power and the Renewal of Professional News Organizations: The Case of the Guardian and the Edward Snowden NSA Leak’ International Journal of Communication 8. Chadwick, A. (2014) ‘From “Building the Actions” to “Being in the Moment”: Older and Newer Media Logics in Political Advocacy’ The Nonprofit Quarterly21 (1), pp. 54-61. Chadwick, A. (2011) ‘The Hybrid Media System’ Presentation to the European Consortium for Political Research General Conference, Reykjavik, Iceland, August 25–27. Digital communication technologies are now central to our understanding of political, social, economic, and cultural life. Initiated in 2008, this book series brings together scholars with an interest in understanding the information and communication environments which shape, and are shaped by, politics. The series is concerned with theoretical and conceptual debates, institutions and behavior, and policy issues. It provides an important, high-profile publishing outlet for a range of talented authors, both established and up-and-coming. Books in the series analyze the politics of new communication technologies, broadly defined. They may summarize and criticize existing literature as well as provide new departures. The series is multidisciplinary and interdisciplinary, drawing upon perspectives in media and communication, political science, international relations, sociology, policy sciences, law, public administration, cultural studies, economics, management, information science, and human geography. Series books have been recognised with multiple distinguished international book awards. Click here for a current snapshot of the series, including published and forthcoming titles. For further details and information on how to submit a proposal, please visit the OUP Studies in Digital Politics webpages. I was a founding Associate Editor (2006-2009) of this new journal and now serve on its Senior Editorial Board. The JITP is published by Routledge, and is affiliated with the organized section on Information Technology & Politics of the American Political Science Association. The senior and full international editorial boards currently consist of over 100 researchers in the field. The journal’s current editor-in-chief is Michael Xenos at the University of Wisconsin-Madison. Despite the recent growth of research on social media and politics, we know almost nothing about the online behavior of some of the most influential political organizations in the advanced democracies: think tanks. This multi-method, two-phase project is supported by a grant to me from the British Academy/Leverhulme Trust scheme. The second phase of the project examines the role of broadcast media in constructing the authority of the IFS during the 2015 general election. Chadwick, A., McDowell-Naylor, D., Smith, A. P. and Watts, E. (forthcoming, 2018) ‘Authority Signaling: How Relational Interactions between Journalists and Politicians Create Primary Definers in U.K. Broadcast News' Journalism. Anstead, N. and Chadwick, A. (2018) ‘A Primary Definer Online: The Construction and Propagation of a Think Tank’s Authority on Social Media’ Media, Culture & Society 40 (2), pp. 246–266. In 2016, with Jennifer Stromer-Galley, Director for the Center for Computational and Data Sciences at Syracuse University, I co-edited a seven-article special issue of the International Journal of Press/Politics on digital media, power, and democracy in parties and election campaigns. This grew out of a 40-participant international workshop we organized in Washington DC in 2015. 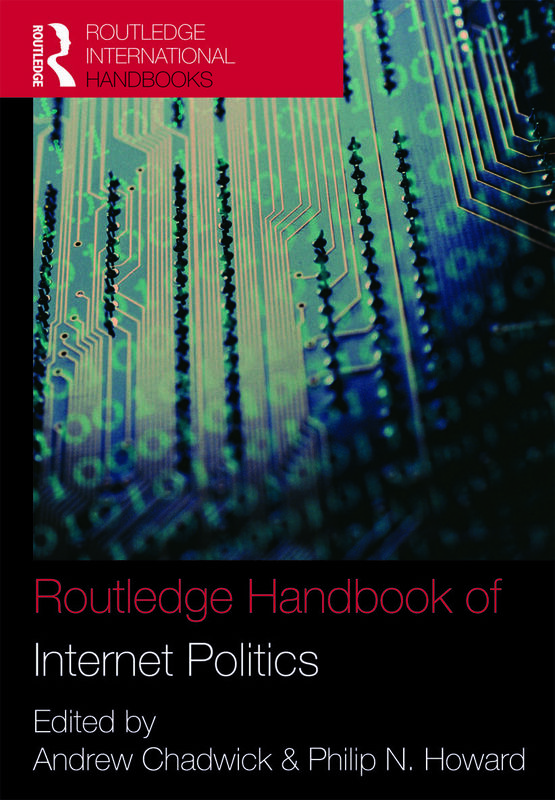 A prestigious reference work providing a thematically organized overview of the whole subject area of Internet politics and policy, broadly defined. A survey of the state of the art including emerging and cutting edge areas. A synthesis of important work and a means of punctuating the development of a scholarly field. A means of providing linkages to established theories of media and politics, political communication, governance, deliberative democracy and social movements. Made up of a strong cast of international scholars; a mix of big names, rising stars and more junior academics drawn from the US, the UK, Europe and beyond. Chadwick, A. and Howard, P. N. (eds) (2009) The Routledge Handbook of Internet Politics (Routledge, New York and London). 512pp. The NSF-funded International Working Group on Online Consultation and Public Policy Making (IWG) was a three-year (2007-2009) research effort focusing on (a) how to evaluate the policy and other social impacts of online citizen consultation initiatives aimed at influencing actual government decision making, and (b) how the optimal design of such initiatives is affected by cultural, social, legal, and institutional contexts. Its sub-groups considered the impacts of online consultations on government agencies and policy makers, the impacts of online consultations on public participants and civil society organizations, the relationship between the design of consultation and the kinds of impacts identified, and the ways in which legal, political and institutional context shape prospects for success. US participation in four international working groups was supported by $280,000, through a grant of $1,000,000 to the Center for Technology in Government at the State University of New York at Albany, from the National Science Foundation’s Digital Research Program (PI, Sharon Dawes, SUNY-Albany). The project’s outputs included a series of four conferences (at Harvard University, Ohio State University, the Aspen Institute in Washington, DC, and at Sciences Po, Paris), a special issue of the journal I/S: A Journal of Law and Policy for the Information Society, and an extensive edited volume published by MIT Press, Connecting Democracy: Online Consultation and the Flow of Political Communication. I contributed articles to the I/S special issue and the edited volume.